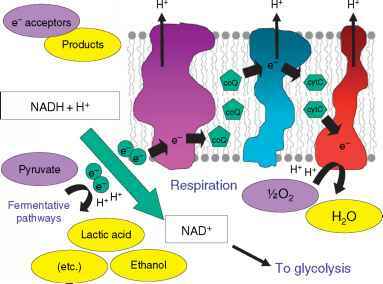 Figure 6 NAD+ regeneration by fermentation vs. electron transport. 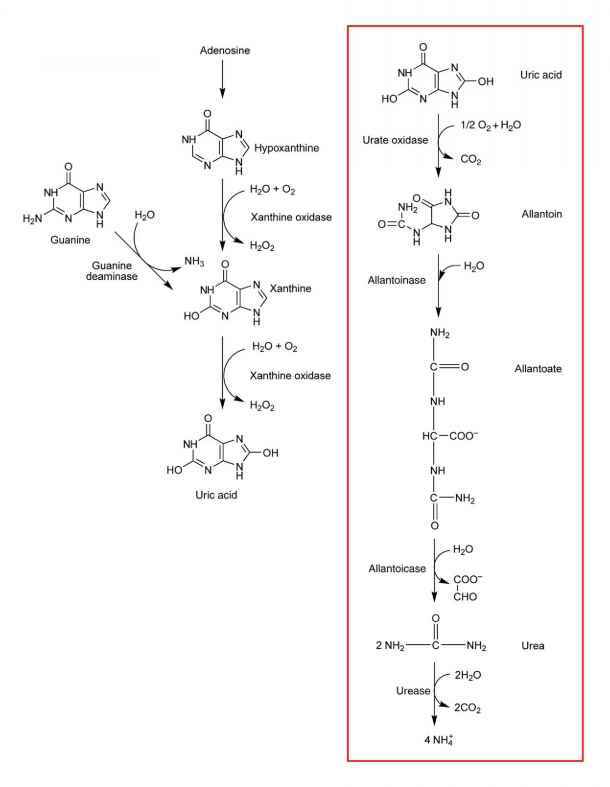 For the sake of ongoing glycolysis (Figure 4), NAD+ must be regenerated from NADH. This can be accomplished either by fermentative pathways (pyruvate or derivative here serving as the final electron acceptor of the electrons carried by NADH (see Fermentation)) or via ETSs (O2 here serving as the final electron acceptor of the electrons carried by NADH). Reduced products of this electron transfer are shown in yellow. electron donor, to ubiquinone. Complex III (cytochrome bcx complex, ubiquinol:cytochrome c reductase) mediates electron flow from ubiquinone to cytochrome c, which then transfers the electrons to O2 via complex IV (cytochrome oxidase). Protons are pumped out of the mitochondrial matrix and into the intermembrane space during the electron-transfer reactions mediated by complexes I, III, and IV, producing the proton gradient. Protons flow back into the mitochondrial matrix through the mitochondrial ATP synthase, which couples the energy of proton transfer to the synthesis of ATP. Additional complexes form part of the ETS in certain organisms. In some cases, these additional ETS components bypass proton-pumping complexes, thus lowering the production of ATP. In plants, an external NADH dehydrogenase can transfer electrons from NADH on the outside of the inner membrane directly to ubiqui-none, thus bypassing complex I. In some plants and fungi, an alternative oxidase transfers electrons from cytochrome c to O2, thus bypassing complex IV. Because the energy released by these electron-transfer reactions is not coupled to proton pumping, it can be released as thermal energy. It has been demonstrated that in the flowers of certain thermogenic (heat-generating) plants, the alternative oxidase functions to generate heat, volatilizing aromatic compounds that attract insect pollinators.